The way salespeople around the world eat lunch and how it affects their productivity is very different. So here’s a side-by-side comparison of eight countries’ lunch habits and productivity, diving head-first into data. The line represents in percentage terms the number of activities completed (calls, meetings, emails sent, etc.). We expected a sharp rise in the activity level during morning hours, then a sharp dip for lunch hours, and then another peak just after lunch. We expected the evening productivity drop to be a little less sharp than the morning rise. It turned out, however, that while parts of our expectation on salespeople’s productivity were correct, there are far more activity level curves around the world than we anticipated. 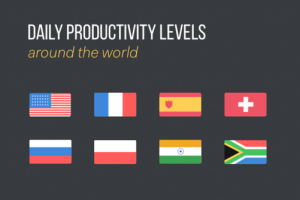 Those whose peak productivity takes place after lunch, including France and Switzerland. 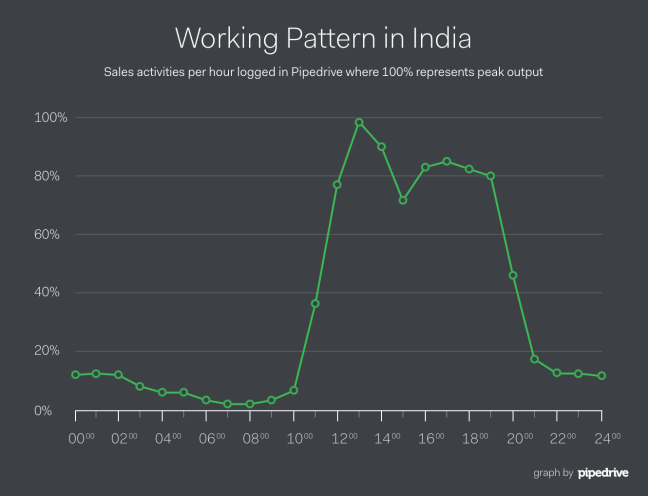 Those whose peak productivity takes place before lunch, including India, Spain and South Africa. Those who don’t eat lunch (seemingly), including the United States’ East Coast, Poland and Russia. Consequently, we had three hypotheses about the different lunch habits of salespeople around the world, as well as how the makeup of those lunches affects people’s productivity. Category #1: In countries where peak productivity takes place after lunch, good rest and hearty foods help salespeople focus better and work harder afterward. In France, salespeople tend to take their lunch breaks (and wine?) very seriously, as the productivity levels drop very sharply from the hour leading up to the break. But productivity rises to an even higher level and seems to last for a long time. 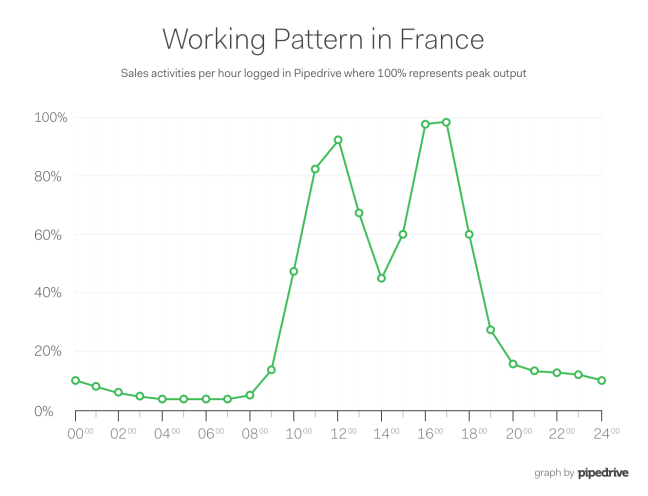 The peak business hour for the French is the latest of all the countries researched – 4 p.m. The level of activity in all hours from 3 p.m. to 6 p.m. exceed the pre-lunch peak taking place at 11 a.m. The French lunch with its very low activity level allows for complete relaxation from the working environment. In fact, the productivity in France is lowest during lunchtime compared to any other country researched. As seen from the graph above, when this timeout is complemented with enough nourishing calories, the salespeople in France work like mad after lunch. So take a leaf out of France’s book and take the time to enjoy your breaks – you’ll get be incredibly productive afterward. In Switzerland, the general lunch trend is similar to France. They relax during their lunch hour and then ramp up their activity levels to record heights. In the same fashion to the French, the evening activity levels exceed that of the pre-lunch peak, which takes place at 11 o’clock. The only exception is that after lunch, the Swiss work hardest from 2 p.m. to 5 p.m., rather than 3 p.m. to 6 p.m. in France. Quite interestingly, salespeople in Switzerland work until quite late. 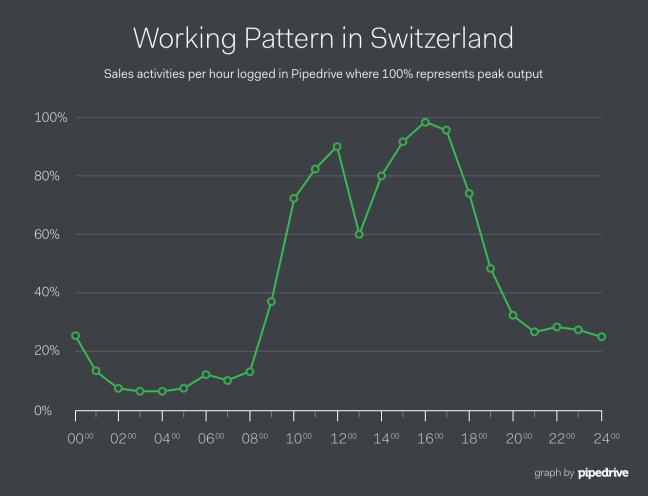 If in other countries, activity levels drop down to nearly zero after business hours, then the Swiss simply keep on going – even between 9 p.m. and midnight. With this information coming to light, could we say it’s true after all that everyone in Switzerland works for a bank or a multinational dealing with the Americas? In India, great activity heights are achieved just before lunch while lunchtime takes place over two hours, rather than one like in most other countries reviewed. The drop from the pre-lunch peak during the two hours seems pretty steep until you look at the three hours that follow lunchtime. Then, a very high average activity curve is maintained, giving some support to our hypothesis that the energy released is not meant for sprinting, but for a marathon. And a marathon it is – in India, salespeople work six days a week instead of the conventional five. What this proves is a hard-working attitude, where food needs to complement long-term working ability rather than a short-term focus. Admittedly, salespeople work a little less on Saturdays. Whether that’s intentional or depends on the whole country slowing down a little is hard to tell from our data.But what this shows us is that it’s a good idea to track the activity levels of yourself, as well as your team members, so that you don’t miss your goals. Read more about how to set sales goals from a recent blog post detailing how you can achieve double-digit sales growth by making use of activity goals. In Spain, lunch is expected to last up to two hours on business days, according to InterNations, a site dedicated to connecting expats around the world. What’s surprising about the data we extracted is that the world-famous siesta doesn’t seem to appear anywhere. Though you can clearly see a two-hour break, the lunchtime low to which activity levels drop is about average around the world, not lower as the stereotypes would allow you to think. Referring back to Internations, the explanation can be found from two things. First, the Spanish now use lunch breaks for business meetings, which means salespeople could actively be engaging with their prospects over some paella. 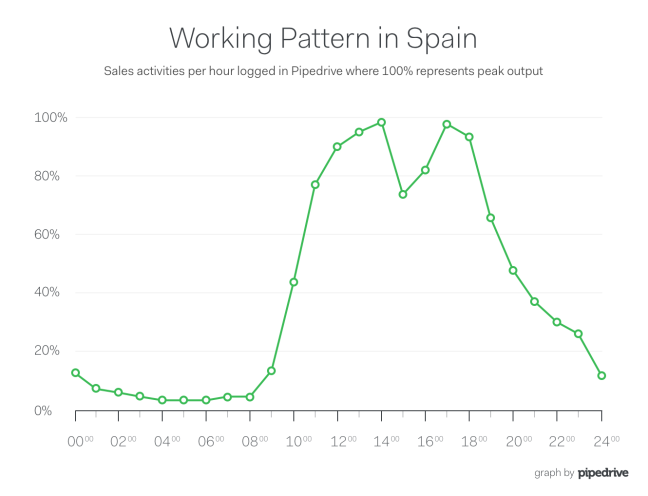 Second, something keeps Spanish people working till quite late in the day – according to our data, on average till 10 p.m. 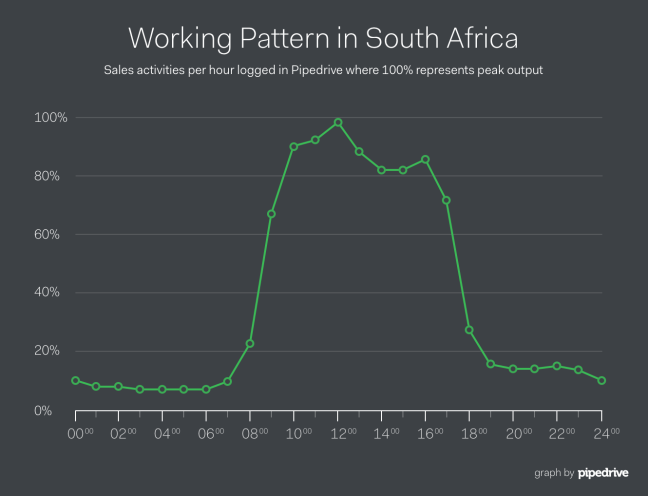 When most countries have a rather distinct time of day when they head to lunch, South Africans not so much. The only thing they have agreed upon is that it should happen after 11 a.m., after which a smooth drop in activity levels takes place. They hit an after-lunch peak at 3 p.m., but other than that, their performance is quite consistent throughout the day, not hitting incredible highs and not dropping to deep lows. Looking at our previous research, however, we find that this doesn’t matter all that much, because regardless of whichever way the South Africans work, they are the best closers in the world. Do you reckon they get to drink a lot of coffee? Our final category includes countries with no apparent lunchtime. For different reasons, salespeople in countries in this category simply don’t seem to take lunch breaks. This graph tells us that the Polish salespeople simply don’t eat – they simply work incredibly hard, logging calls, emails and meetings throughout the day. When speaking of productivity, naturally, what goes up must also come down. The peak productivity takes place at 1 p.m., while high productivity runs from 10 a.m. to 3 p.m., dipping sharply afterward. The fact is the Polish indeed eat lunch, but the in Poland (and please correct me if I’m wrong) salespeople eat packed lunches on their posts, which allows them to keep on going and work hard even when other people head off to cafés and diners. American salespeople are renowned for their hard-working attitude. But it’s interesting to note that the lunch habits on the East and West coasts are significantly different. For one, heightened productivity levels for salespeople on the West Coast, mainly in California in our data, come during the morning hours peaking already at 10 a.m. Lunchtime low arrives at noon, after which productivity plateaus until 4 p.m. after which it drops quickly. 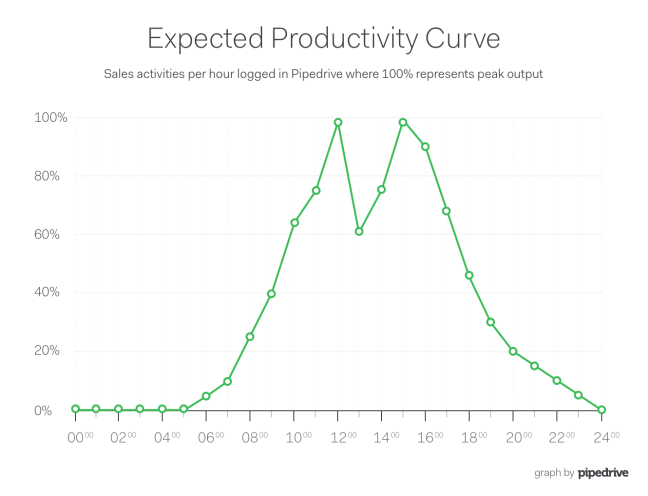 Interestingly, 12 o’clock s the peak productivity hour for salespeople on the East Coast. Much like the Polish, it seems that salespeople in New York and Washington tend not to have lunch at all, or they have it at their desks. If Glengarry Glen Ross is anything to go by, then we can assume that lunch really isn’t an option for many salespeople – “work hard and keep on going” is how people achieve their targets. in which we found that the sales environment in the States is one of the most difficult ones – one sale takes many activities, while the conversion rate is low. So whoever works hardest gets the prize in the United States. 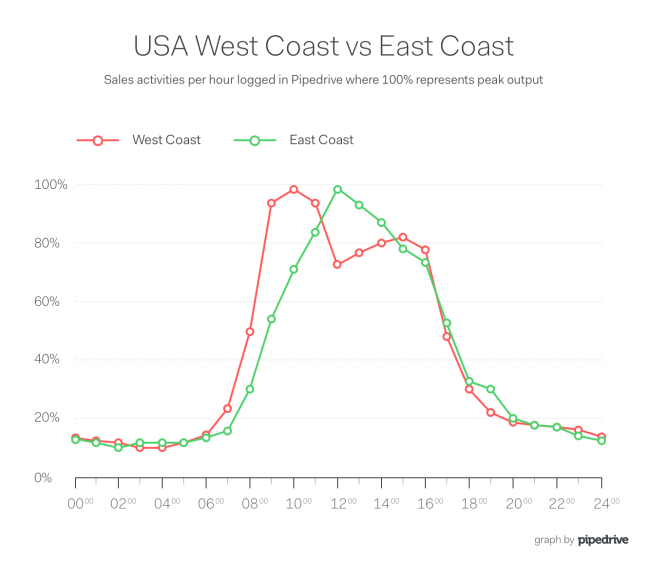 Another interesting point to the sales culture in the States is that salespeople in the Mountain and Central time zones have very similar working habits to those on the West Coast. High productivity mornings with plateauing afternoons. The working patterns in the United States are possibly explained by salespeople on the West Coast waking up early to start selling to people on the East Coast, and thus get to clock out a little earlier, respectively. Just as noon (and hunger) approaches on the East Coast, the salespeople there will need to start calling their recently woken-up West Coast prospects, thus missing out on lunch. Obviously, that’s more of a joke. 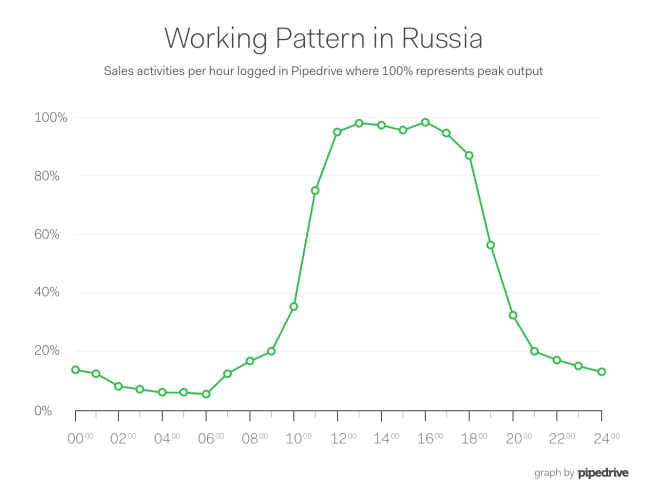 However, what we can see from our data is that Russians work consistently hard throughout the day, logging emails, meetings and other activities in a steady pace. While 2 p.m. does seem to look like a lunch hour, the dip in activity levels is barely noticeable. In fact, out of all the countries that exhibited some sort of lunch break – Russia’s lunch-hour low was the smallest, dropping to a mere 91% productivity level compared to the daily peaks. This is why we consider them to be a more likely part of our third category, where salespeople either don’t have lunch, or eat it at their desks. This is further supported by the difficulty of the sales environment in Russia. When you compare how hard salespeople have to work to make one sale (counting the number of activities per sale) and the overall conversion rate, you’ll find Russia to have a grueling sales environment (lots of activities, low conversion). Notably, all countries where lunch doesn’t seem to have an effect on salespeople’s activity levels exhibit a similar sales environment – low overall close rate, and lots of activities required for one sale. What this tells us is that rather than lunch affecting the way you sell – the way you sell affects the way you get to eat lunch. Could it be that what you eat determines how you work? Well, there’s no definitive answer. We can only speculate that if you eat so-called brain food, you’ll be more productive than if you don’t. According to Matthew Johnson’s article in Udemy, lunch eaten by the French comes in all shapes and colors. Many like having ham and cheese baguettes, while others savor three-course meals accompanied by wine and coffee. With the latter option, the French take business to lunch breaks, holding many of their meetings over a soup, main course and a dessert. With food as good as in France, who could blame them. Since the food they usually eat involves a heavy dose of bread, rice, potatoes and pasta (all carbohydrates), our naive hypothesis that the French eat high-protein brain food during lunch is a little off. All there’s left to explain the high productivity is the aforementioned strong combination of food and rest. Similar items of food can be found in the lunch lists of the Spaniards, and with long breaks, their high post-lunch productivity is also well explained. Researching the lunch eaten in Switzerland, we found that it’s quite similar to the French – bread or a full-blown meal. Of course, with Switzerland you have to take into account the different customs in the different regions of the country. Depending on whether the salespeople live in the German, Italian or French-speaking part of Switzerland, their cuisine will be more similar to the meals in those respective countries. India is the home to the famed tiffin, which according to an article in The Guardian is a combination of spicy vegetables, dhal, rice, yoghurt, pickles, bread and pudding served on a big steel plate or a banana leaf. Speak about rich lunches. If you take a break, do it like you mean it. You’ll be far more productive if you drop everything you’re doing and relax completely. If you work in a country with a difficult sales environment, keep some hearty snacks ready. Fruits, nuts and wholemeal snacks will help you get through the day without a proper break, while keeping up your productivity. Since this study is based on anonymized metadata, we’d like to see the anecdotal evidence in the comments section below. What do you normally have for lunch? Does it affect the way you work, or does the way you work affect how you eat? How much do you think is up to your country’s culture, and how much to the sales environment?